Sooo, last night I decided to separate my groom’s cakes from wedding cakes in my Facebook albums. To do that, I had to create a new album by first adding a picture. I chose the last groom’s cake I did… sort of on a whim! 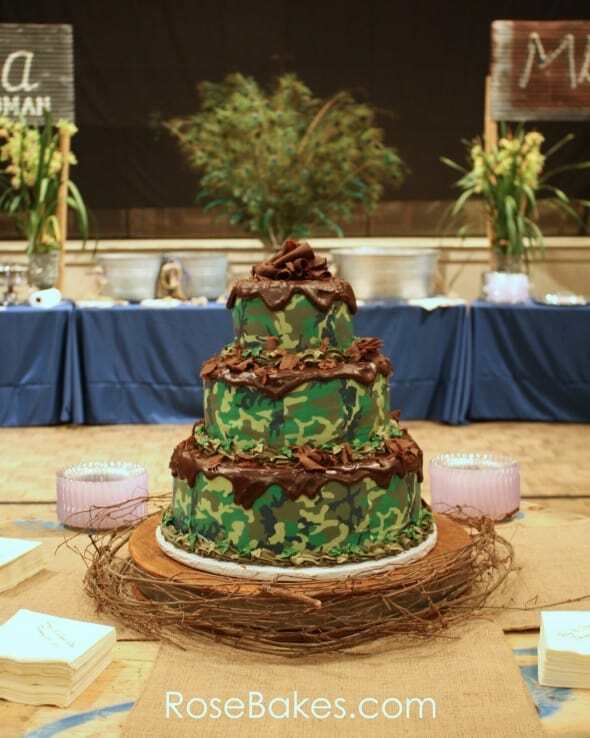 I had no idea how popular the Camouflage Groom’s Cake would quickly become! And since it was fresh on everybody’s mind… I thought I’d go ahead and share a few more pictures! This cake had three different flavors… strawberry cake for the top, chocolate cake for the middle, and vanilla cake for the bottom. It was all filled with vanilla buttercream. After that, I covered all the tiers with homemade marshmallow fondant. Then I stacked it all up (see how I stack cakes here) and got ready to decorate! I got lots of questions on Facebook about the actual camouflage, so I thought I’d share a bit more information. For the camouflage, I used printed edible images. 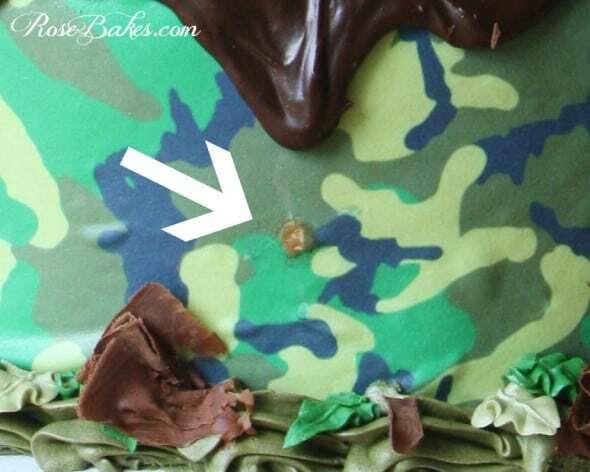 I rubbed a thin layer of shortening all over the sides of the cakes, then wrapped the camouflage sheets around each tier, cutting them to fit. For the tops of each tier, I poured thick delicious ganache on and let it drip over the edges and down the sides. 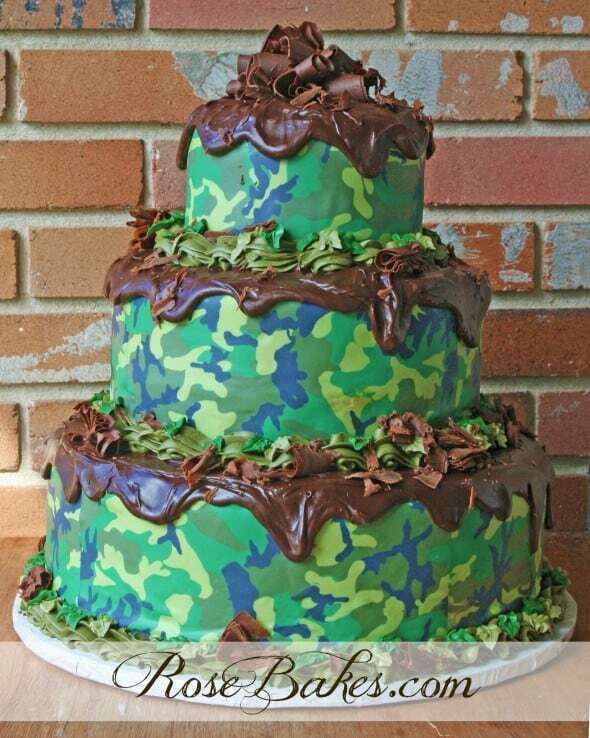 That covered the top edge of the edible image and it made me think of mud… which goes hand in hand with camo, right? For the bottom of each tier, I piped on a generous buttercream border (in a shade of green that I will not name). 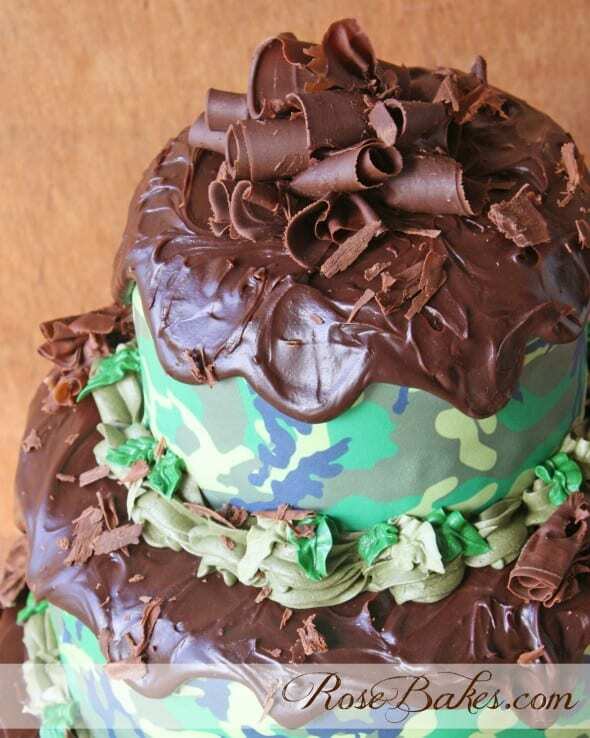 I didn’t mean to make it an ugly color – I just kept trying to mix up browns and greens until I got one that matched the camo… and well… it came out “that” color that I won’t say. It did match and it looked great on the cake. But when I accidentally dropped a big blog on the counter – notsomuch. I digress. So, back to the images. 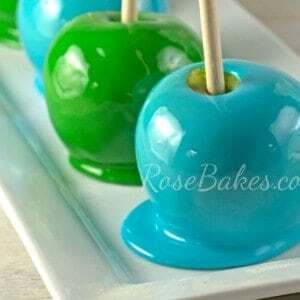 They are very durable and if you freeze them for just about 10 seconds – they peel off easily and are not at all hard to work with! The shortening helps them stick to fondant very easily and you can shift them around a little if you need to. But I don’t need to tell you everything… I’ve ordered from different suppliers for different cakes/images and they always come with great instructions. My only tip that I don’t remember reading (although it was probably there) is that you need to be very very careful and not get any water on them. At all. That seems obvious, but I wash my hands constantly when decorating and at some point a drop of water landed on one of the sheets and I ended up with a bright white spot. Wanna see? Oops. Wanna know what I did with it? I tried to smudge it with a bit of brown frosting to cover it up… and when that didn’t work, I called that side “the back of the cake”, Photoshopped it out of the pics where I forgot to turn the cake (yep, I do that!) … and went on with the show. Sometimes you just can’t sweat the small stuff… or the things you can’t change! Anyway, you get the idea! I often forget to mention this and folks always ask, so the cake size was 6″, 9″ and 12″ round tiers. Each tier had two layers of 2″ cake and filling in between. Did I miss any details? Do you have any questions about this cake? Please leave them in the comments! I love to get comments & questions! Very nice. I love the ganache over the top of each tier. 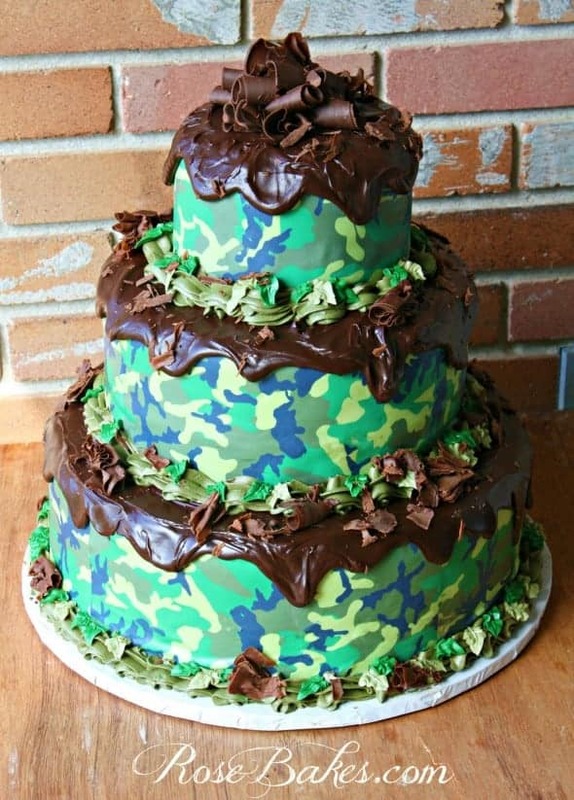 I’m about to make a camouflage cake and was looking up ideas. Mine is just a small 8 inch birthday cake and I plan on coloring balls of fondant and rolling them together to get the effect. Thanks for your beautiful cakes. I would be honored if you would add a cake with a story anytime at my website. Or enter a contest there.Happy cake decorating and baking. I’m making a birthday cake with these exact tier sizes and I’m fairly new at all this. How do you convert a box recipe for 12″ and 6″ pans? Sorry if you’ve answered this elsewhere; I’ve looked around some but couldn’t seem to find the answer to that. Thank you and I look forward to perusing your site more. We’re neighbors 🙂 Well, sort of…I live in Baton Rouge. My doctored cake mix recipe makes 5-6 cups of batter(I haven’t measured exactly) I use the Wilton chart to determine how much batter to use for each pan size, then determine how many doctored cake mix batches I need to make to fill different sized pans.